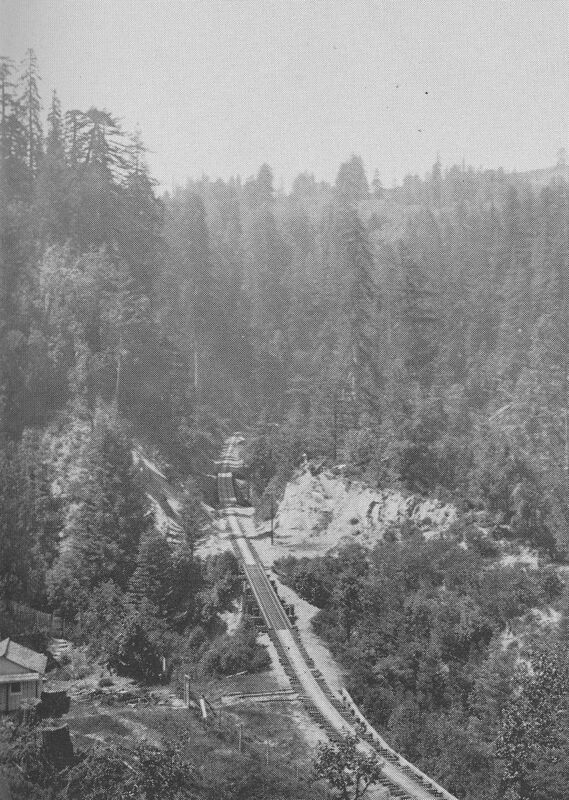 Unlike the railroad route through the upper Los Gatos Creek basin, the tracks between the Summit Tunnel (Tunnel #2) and the Mountain Charlie Tunnel (Tunnel #4) encountered relatively few obstacles. The only major body of water crossed that required a full bridge was over Burns Creek, just outside the Summit Tunnel's eastern portal. The South Pacific Coast Railroad's original narrow-gauge bridge and the Southern Pacific standard-gauge bridge that replaced it around 1907 were remarkably similar. They were both open-deck, redwood trestles composed of four bent-and-post piers evenly spaced across the creek bed. The bridge was neither long nor tall and successfully withstood a number of torrential storms over the years. During the years that the Hihn mill ran along Laurel Creek, the bridge faced an occasional threat of flooding and damage caused by logs since an upper mill pond was installed just below the bridge. 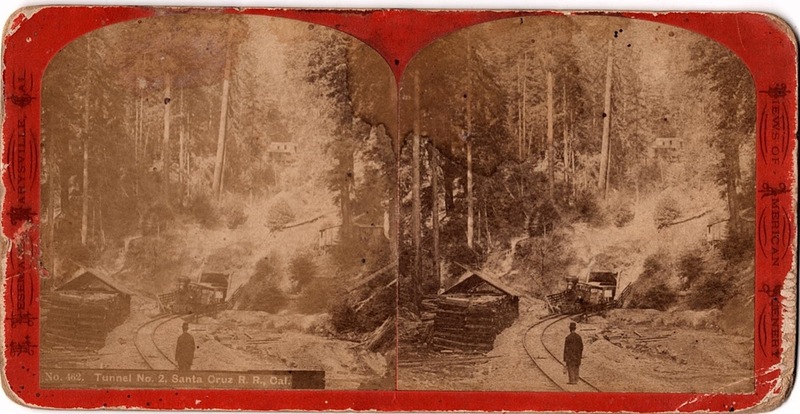 An early stereograph of the image, visible above, shows the pond to the right of the tracks, with loads fuel wood stacked on the opposite side of the tracks beneath and beside a small shed. This original bridge appears to have been narrow, with a tall fence on the northern side, probably to keep debris off the tracks, and a shorter fence on the southern. The later standard-gauge bridge, built around 1907, was a significantly wider structure, with footpaths on either side of the tracks and short railings lining either side. Guard rails were installed across the entirety of the bridge, probably because the curve was fairly sharp for large locomotives and the slope toward Santa Cruz was downhill. When the line was demolished in 1941, the bridge was only partially removed. The deck, ties, rails, and footpaths were scrapped but the bents and posts were left behind, where they remain today. Visible immediately across from the Summit Tunnel's still open eastern portal, this bridge stands as a testament to the durability of redwood coated in creosote. Further remnants of trestlework survives along the right-of-way to the west, although there were no proper bridges along this stretch. 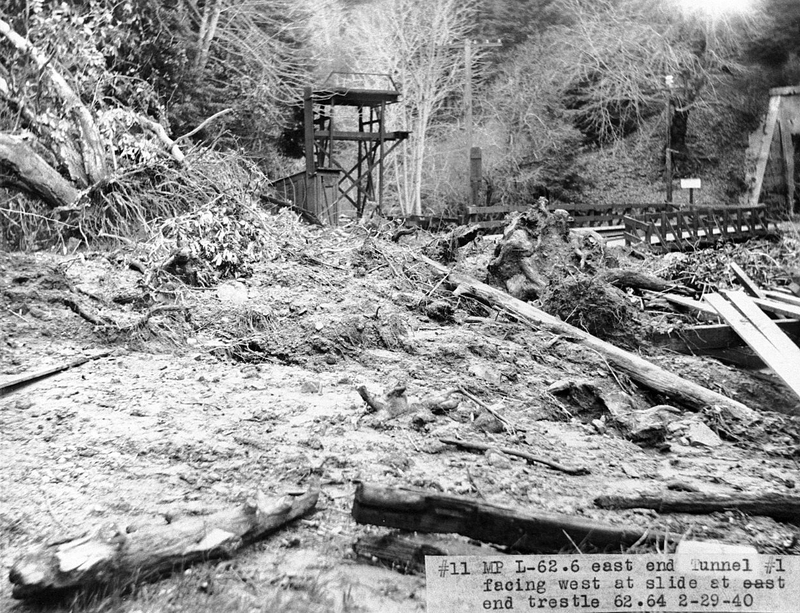 When the South Pacific Coast Railroad crews first constructed their path alongside the hillsides over Soquel Creek, they found it much easier in most cases to build half-trestles. Half-trestles are actual full trestle bridges, but they are only slightly raised off the ground, usually to provide stability on terrain that is impossible to completely level or that is prone to washouts. The latter was the predominant reason for why they were used here. A total of three such trestles were required between the Burns Creek bridge and Laurel station. In the photograph to the right, two of the three half-trestles can be seen (the third is in the photograph above). Generally, the tracks were raised above the ground on posts and a large flat beam is placed atop the posts to provide a level surface upon which to install the ties and rail. The half-trestles in the Laurel area did not have any boardwalks for pedestrians—presumably they could walk below them, as seems to be the case in this photograph—and they were all open-deck plans, meaning they required no ballast. The sawed-off and partially buried remnants of some of these half-trestles can be viewed alongside the private driveway near Laurel that once served as the right-of-way. The driveway meanders in-and-out of the original track alignment, but the posts give a good idea where the route originally passed. Even less bridgework was required in the Bean Creek area around Glenwood and Clems, and no photographs survive of anything that was required. The only actual bridge built was a very short structure over Bean Creek just beyond the Glenwood station grounds to the south. Indeed, it is unclear whether there was actually a structure here or whether the creek was simply culverted under the right-of-way. Regardless of its original construction, it was certainly culverted around 1911 and remains so today, passing under both the right-of-way and Glenwood Drive. Approximately 0.3 miles to the south, Bean Creek crossed back under the road and right-of-way through a larger concrete culvert, which likely replaced an earlier wooden culvert. Considering how far beneath the roadbed this culvert is located, it seems unlikely that a bridge was originally erected here. Between this second crossing and the Mountain Charlie Tunnel, the railroad grade ran along an extremely steep hillside, forcing the railroad to once again resort to using half-trestles to ensure an even and stable grade. Although no photographs and only limited documentary evidence for these half-trestles survives, remnants of these half-trestles can be easily viewed across Bean Creek along the 0.5-mile-long portion of Glenwood Drive between Stonewood Drive and Tadstone Lane. Like in the Laurel area, the right-of-way here has been repurposed as a private driveway and also realigned into the hillside, but many of the old posts showing the railroad alignment remain. 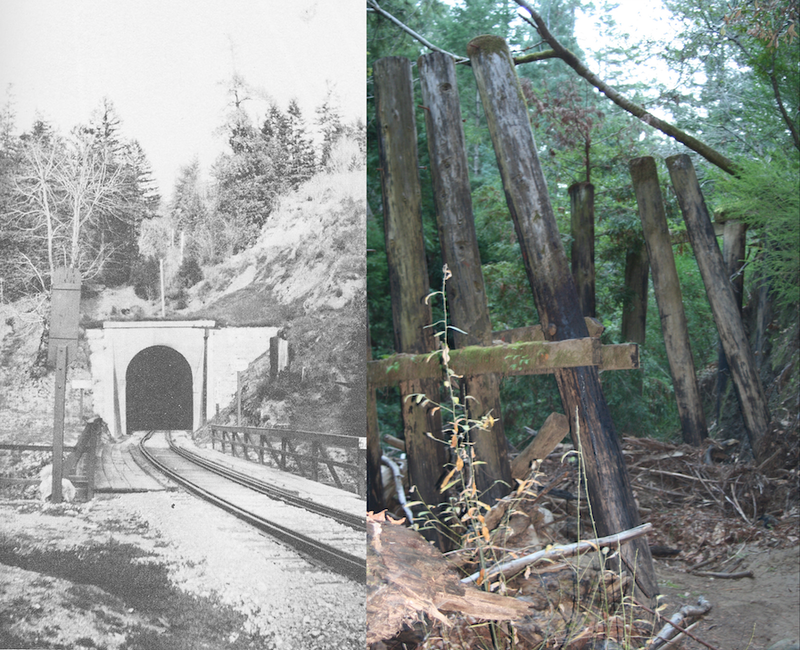 All of these bridges and half-trestles are proof that building a railroad through the Santa Cruz Mountains was difficult and required a number of costly compromises, but also that it was not insurmountable. Indeed, although the area between the Summit Tunnel and Mountain Charlie Tunnel was some of the harshest terrain the railroad encountered, it relied on relatively few bridges and half-trestles to achieve its goal. 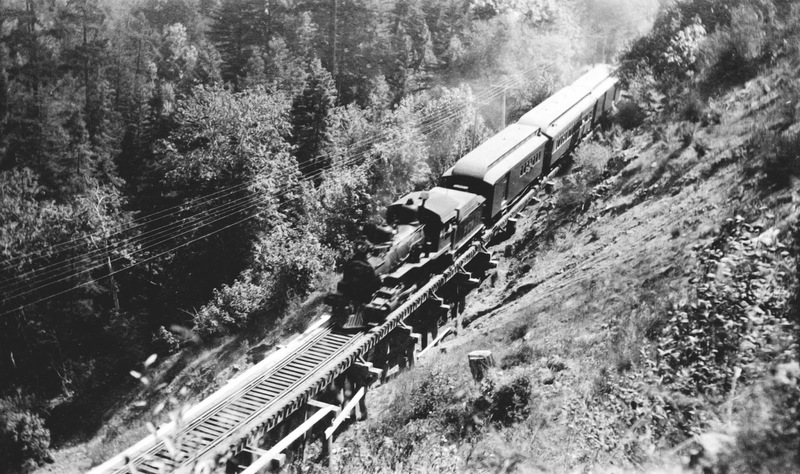 The surveyors and grading crews hired by the South Pacific Coast Railroad were experts in their craft, and people today still benefit from their expertise. The early fence along the narrow-gauge bridge appears to be a cattle guard, with the bridge playing its part in creating an obstacle against entering the tunnel - just a guess. Photos of the current right-of-way would be nice, if easily found. It's also curious that the Summit Tunnel appears to be the only tunnel to never have had tell-tales - those structures with the dangling ropes to warn brakemen walking along the tops of railcars of a hazard. The practice of walking on freight cars lasted into the 1970s, and was an everyday occurrence when switching at the Lake Majella location, for instance.